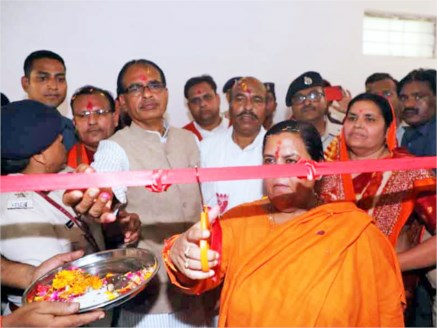 Chief Minister Shivraj Singh Chouhan and Union Minister for Drinking Water and Sanitation Sushri Uma Bharti inaugurated the combined District Collector and SP Office in the 52nd district Niwari of the state on September 30. CM Chouhan performed pooja of the newly-constructed District office building and inaugurated the chambers of the Collector and Superintendent of Police. He also introduced new Collector Shri Abhay Pratap Singh and SP Shri Mukesh Kumar Shrivastava on this occasion. It may be mentioned that a new district ‘Niwari’ has been formed by the government by joining 3 tahsils i.e. Niwari, Prithvipur and Orchha of Tikamgarh district. This district will start functioning from October 01, 2018.